If you hang out with industrial designers, one thing you notice is that they’re really into chairs. In fact, you can often guess a designer’s favorite chair maker from his or her shirt. Black button-down? Mies van der Rohe. Black turtleneck? Peter Opsvik. Low-cut black V-neck and conspicuous hair product? The Campanas. Every design school graduate wants a cool-looking chair in his or her portfolio, and chair design can be a savagely competitive field. I hate to rain on their parade, but here’s the thing: Chairs are evil. All of them. No designer has ever made a good chair, because it is impossible. Chairs are a health hazard, they’re morally troubling, and we’ve become dependent on them—and it’s not clear that we’ll ever be free. It sounds absurd to claim that chairs are dangerous. They seem almost too boring to be harmful. But when you read all the recent headlines about the dangers of sitting—the risk of heart disease, obesity, diabetes, depression, and practically innumerable orthopedic injuries—what you are really seeing is an indictment of what we sit on. The real issue is that sitting, in our society, usually means putting your body in a raised seat with back support. The problem, in other words, is chairs. Different chairsget different things wrong. Uncomfortable chairs typically put adverse pressure on the body, or require excessive muscular work in order to sit. Comfy chairs are even worse. By encouraging you to remain in a single static position for long periods without moving, they put extended, unrelieved stress on your spine and weaken your muscles. A number of Scandinavian designers have designed ball chairs, kneeling chairs, and chairs that encourage sitting in several different positions. These are improvements. But they’re not total fixes. They also frequently don’t work properly at common table heights, and not everyone wants to be the guy at work who sits on a ball. If chairsare such a dumb idea, how did we get stuck with them? Why does our culture demand that we spend most of every day sitting on objects that hurt us? The answer lies in class politics. Chairs aren’t just about not wanting to stand; they’re about status, power, and control. 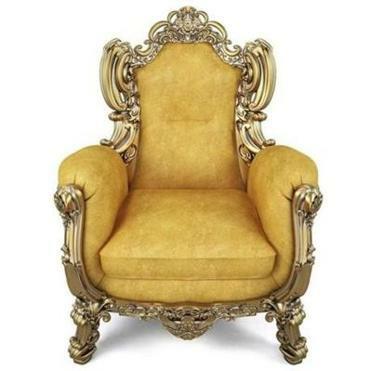 Ask any furniture historians about the origins of the chair and they’ll gleefully tell you that it all started with the throne. Some time in the Stone Age, probably between 6,000 and 12,000 years ago, high-status individuals began to sit on small raised platforms, just large enough to hold a single person and with a backrest to support or frame the sitter. The earliest evidence of these primitive thrones comes from figurines excavated in southeastern Europe, but single-person seats with a back were important status symbols in ancient Mesopotamia and Egypt as well. During the Middle Ages, chairs were not common in the Western world. After the Visigoths sacked Rome, their habits of squatting and sitting on the ground became predominant. Besides, until the Renaissance, even wealthy feudal households had very little furniture, because they had to keep moving around to avoid getting sacked themselves. The richest families would have had a single massive chair for the exclusive use of the master of the house; this chair was typically too heavy to move (to keep it from getting stolen when the house got sacked). Eventually life got easier for the rich, and lavish furniture became more widespread among the upper class. Style became increasingly important in furniture. But chairs remained an accessory for relatively affluent households. Poor people sat on stools, benches, their beds, or improvised objects like barrels and trunks. That changed with the Industrial Revolution. Suddenly chairs were being made cheaply in factories, and more people could afford to sit like the rich. At the same time, labor was being sedentarized: As workers moved en masse from agriculture to factories and offices, laborers spent more and more time sitting in those mass-produced chairs. Chairs became a tool for teachers to control the movement of children, whose healthy tendency toward activity made them difficult to teach. Today, by the time we reach adulthood, most of us have lost the musculature to sit comfortably for prolonged periods without back support. Chairs, then, are a sort of inanimate parasite, ensuring their continued production by addicting each successive generation of kids. They’re also here to stay for the foreseeable future, and designers are going to keep making chairs as long as there’s a demand for them. But perhaps we could use our cultural capital to popularize alternatives: first backless stools, perhaps, and eventually indoor and outdoor spaces that encourage healthier patterns of activity. Meanwhile, if you want to sit healthily, you’ll have to take matters into your own hands. Many ergonomists recommend that you stay seated for no more than 20 minutes at a time. You should probably get up right now and walk around. @network.rca.ac.uk. This piece is adapted from Jacobin Magazine (jacobinmag.com).